Most people do not notice the complexities of the digestive system. Only when it becomes troublesome do people pay attention to it. 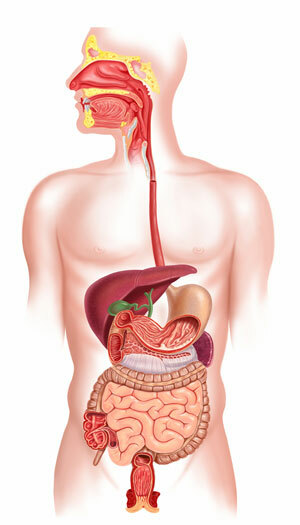 The digestive system is one of the most important systems in your body. It provides your body with the means to absorb essential fluids and nutrients. In it, food is broken down into its microscopic substituents and absorbed into the bloodstream to be used by the rest of the body. It is a complicated process that begins in the mouth and ends in the toilet. Your teeth grind and chew food to make it easier to process. It travels down the esophagus into the stomach where stomach acid and mechanical churning helps to break down particles on the molecular level. After several hours it travels into the small intestines where it gets broken down by secretions that help your body absorb fats, proteins, and carbohydrates. Eventually, the mixture makes its way to the large intestine where water is reabsorbed and waste passed through. Your body couldn’t possibly do all this alone. There are some things that it cannot digest without the help of certain organisms. For example, many people do not make sufficient amounts of lactose-digesting enzymes and are “lactose intolerant.” There are bacteria that enzymes that digest lactose. There are other bacteria that live in your gut and prevent otherwise bad bacteria from taking over. These probiotics help by producing compounds called bacteriocins that prevent bad bacteria from establishing themselves in the gut. Previous scientific thought emphasized the need for sterility and cleanliness. But it has been recently revealed that excessive cleanliness during a child’s early development leads to the development of digestive problems and allergies later on in life. Bacteria are everywhere and we must learn how to live with them. Digestive problems can pop up if we don’t. Diarrhea, constipation, irritable bowel syndrome, and irregular bowel movements are all signs that something is amiss with our digestive systems. The comprehensive formulation of Nexabiotic® may help promote healthy and normal digestion. Nexabiotic® has been formulated to cover all bases in terms of probiotics. 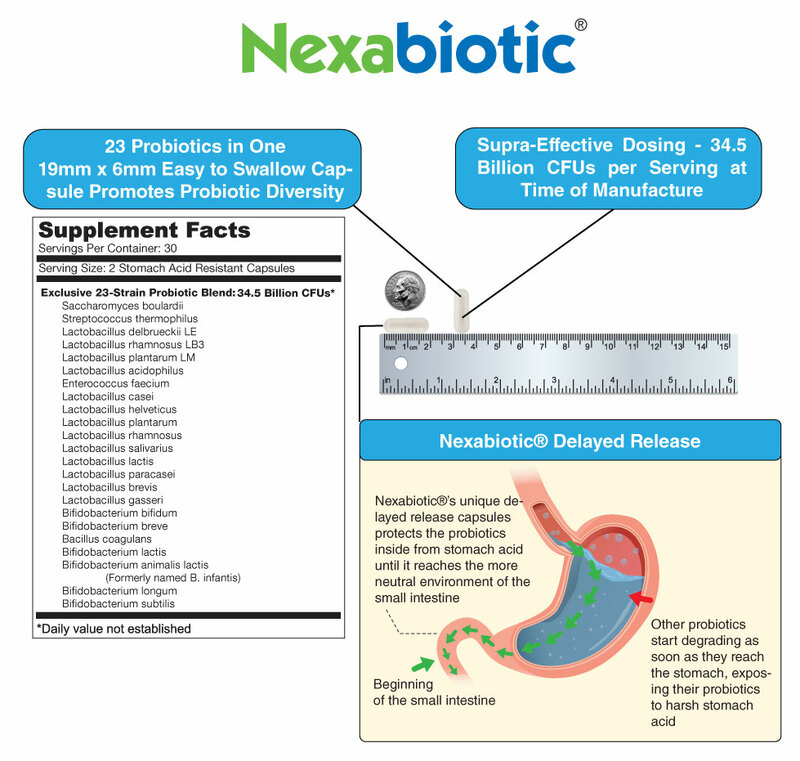 Nexabiotic® provides your digestive tract 23 different kinds of probiotics at a substantial dose (34.5 billion CFUs) which helps restore digestive balance. Not only that but Nexabiotic® capsules are also specially engineered so that its high-quality probiotics survive the harsh stomach acid and make it into the gut where they need to be. The GI system is where the food you eat gets broken down and absorbed into the body. For most of us it functions without a hitch. For others however, each meal is a nerve-wracking experience. Foods that don’t agree cause great discomfort and unpredictable bowel movements. For those, meals need to be planned and the location of bathrooms known beforehand. How well your digestive system functions is indicative of its health. However it is not only your digestive system that does that digesting of food, there are microorganisms that help as well. In fact, there are more organisms living in your colon than there are people living on the Earth. Not much has been known about the role these organisms play until the recent explosion in use of antibiotics. The problem with antibiotics is that they are not discerning. They kill all bacteria that aren’t resistant to that particular antibiotic. As we now know, not all organisms in our colons are bad. Depending on the relationship of the organism with our body, they can be either categorized as mutualistic, parasitic, or commensal. A relationship is mutualistic when both we and the organism benefit. It is commensal when one benefits and the other isn’t impacted. A relationship is parasitic when one organism benefits and the other is negatively harmed. The goal of a probiotic supplement is to maximize the number of mutualistic or commensal organisms within your colon. In doing so, parasitic and harmful organisms cannot establish themselves and cause harm. The mere presence of other organisms in your gastrointestinal tract keeps your immune system running at optimal levels. Often times people who travel abroad will develop diarrhea because their immune systems are not accustomed to the different types of microflora in other countries. What’s so great about Nexabiotic®? The proven formulation of Nexabiotic® includes many probiotic organisms. Each one has been thoroughly researched for beneficial properties and included for a reason. The dosages we’ve included are higher than other probiotic supplements and are protected from the acidic environment of the stomach with an enteric coated capsule.